'Bones' and 'The Mauler' embraced each other after a hard-fought war at UFC 165. There seems to be a pattern developing lately that is connecting UFC light heavyweight champion Jon Jones to his toughest challenger inside the Octagon yet, Alexander Gustafsson. Their fight at UFC 165 back in September has been applauded ever since the final horn sounded as one of the best fights of 2013, and when December comes to a close, the bout will probably win an awful lot of awards for the single greatest fight of the year. Then came the EA SPORTS UFC video game voting. Gustafsson — typically a very soft spoken and definitely not out spoken fighter – defeated every other competitor he faced in fan voting including former UFC welterweight champion Georges St-Pierre to land a spot on the cover opposite, yep you guessed it Jon Jones. Despite the fact that Jones will face Glover Teixeira at UFC 172 in April and Gustafsson has a bout against undefeated British slugger Jimi Manuwa scheduled for March in London, the two light heavyweights appear destined to be stuck in each other’s atmospheres at least until they rematch in 2014. I really want that rematch. "That’s what I think, too," Gustafsson told FOX Sports about always having his name linked to Jones. "I’m very excited. I really want that rematch." There was plenty of argument to be made that Gustafsson could have easily earned an automatic rematch with Jones after their epic battle ended in September, but ultimately the champion opted to move forward with a new No. 1 contender instead. The idea is that Jones will face Teixeira in April, Gustafsson will fight Manuwa in March and then they will meet for a rematch later in the year. Of course there are so many moving parts to a fight coming together that there are certainly no guarantees it will actually happen. Gustafsson knows that feeling all too well so he’s not looking ahead at Jones, thinking he’s assured of anything. If he doesn’t get past Manuwa in March, all of the hype surrounding a rematch with Jones fades away like mist. "I think absolutely, but what I think is the only thing that matters is how you perform and what you do in the cage. For me to get the rematch I need to defeat Jimi Manuwa on the 8th of March. That’s my next opponent, that’s my next challenge and that’s where my focus is," Gustafsson said. 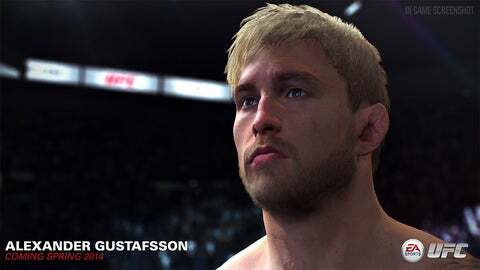 Last week, UFC revealed Gustafsson would grace the cover EA SPORTS video game cover alongside Jones. When March 8 rolls around, Gustafsson will walk into his bout against Manuwa a decided favorite in the betting odds. It’s likely most experts will pick Gustafsson to win going away to set up the rematch with Jones. The problem is Gustafsson has seen this type of reaction before when a fighter was ‘supposed to win’. As a matter of fact it’s the exact same kind of pressure and scrutiny he dealt with when he fought Jones for the first time. The champion was a massive favorite and throughout his UFC career Jones has been virtually untouched by any opponent. Outside of a fleeting armbar attempt from Vitor Belfort and a couple of punches that slipped through his defense courtesy of Lyoto Machida, Jones was as flawless as any fighter could be inside the Octagon. 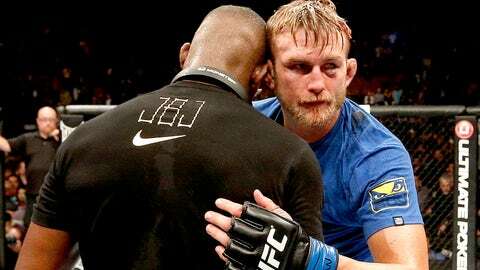 It didn’t matter to Gustafsson because he put on a masterful performance pushing Jones to the brink of defeat and although he still walked away without the title around his waist, he now has the confidence that he stands shoulder to shoulder with the best fighter in the world. I think Jimi Manuwa is the most dangerous opponent so far. Gustafsson now sees the same kind of opportunity for Manuwa. Everyone is counting the Brit out and looking toward the rematch with Jones. Gustafsson promises not to make the mistake of thinking he’s got anything locked up until after March 8 is over. "Not at all. My focus is on the right place. My focus is on Jimi Manuwa. That’s all I think about so it’s all good," Gustafsson said. "The important thing is I don’t (look past him). That’s something I will never do. I think Jimi Manuwa is the most dangerous opponent so far. He’s very dangerous, he’s a very good fighter, very good athlete. The way I see him is as my toughest opponent so far. I’m going to do my homework and make sure I’m ready for the 8th of March."